Rugged. Economical. Easy to use rotameters for flow measurement technology. When measuring liquid or gas flow at higher pressures and temperatures than is suitable for plastic, you can achieve accurate flow rates with robust glass tube rotameters (variable area flow meters) from Brooks Instrument. With a broader range of flow rates available, glass tube rotameters are suitable for a variety of liquids and gases. Resistance to thermal shock, pressure and oxidation is the result of employing borosilicate glass tube bodies that can withstand pressures up to 13.8 bar (200 psi). 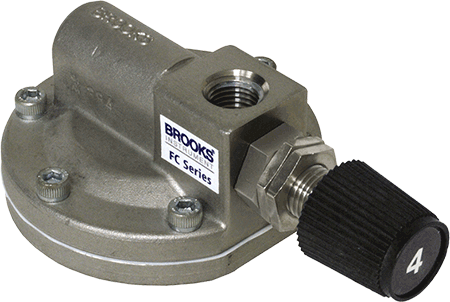 Plus, corrosion-resistant material options for scales, floats, fittings and valves accommodate a variety of applications, whether in the lab or in industrial processes. Select the glass tube rotameter that best meets your project requirements. Zone 1/Zone 2 (CSA/ATEX/IECex) - gas/dust. Protection method Ex-m (no barrier).